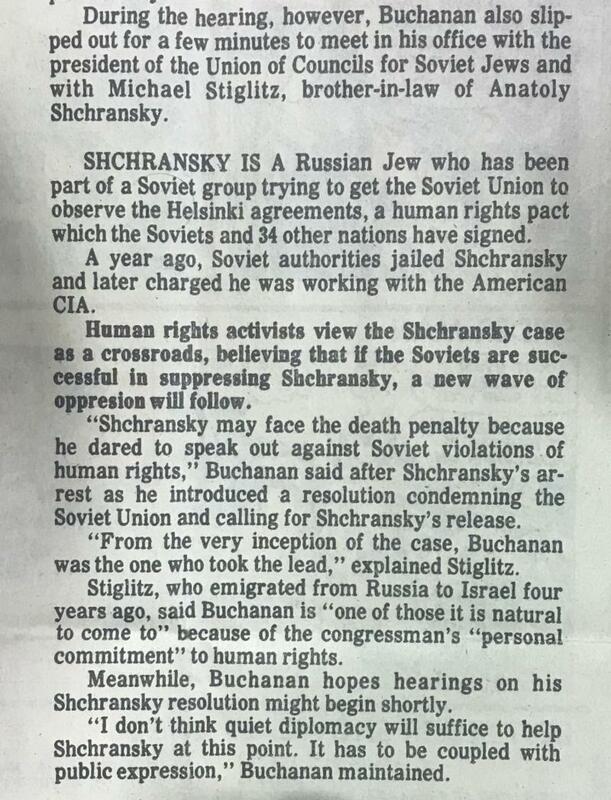 Photo is of excerpt from 1978 Birmingham News’ story reflecting Birmingham Congressman John Buchanan’s efforts on behalf of Natan Sharansky (name spelled differently then), who at that time was an imprisoned Jewish dissident in the Soviet Union. Many Alabama folks well remember former US Rep. John Buchanan, who represented our state’s Sixth District from 1965-1981. Most of Birmingham’s Jewish community lived in Buchanan’s district at that time and he was widely admired by many members of our community. A Baptist minister, Buchanan was first elected to Congress in 1964, part of a new Republican movement ignited in the Deep South by the race for President between GOP nominee Barry Goldwater and pro-Civil Rights incumbent Democratic President Lyndon Johnson. Over the years, however, Buchanan moved from being a staunch conservative (voting against the Voting Rights Act, for example) to becoming one of the most progressive members of Congress and, by traditional Republican standards, a liberal. Even though he professed to be a traditional Republican — pro-business and in favor of limited Federal spending and intervention, for example — on social issues, particularly human rights issues, many came to see Buchanan as an atypical advocate. He would eventually move to the forefront of the battle to gain Congressional representation for the heavily-African American District of Columbia. He also would become an advocate for targeted Federal funding to create more opportunities for black Americans. On Jewish issues, Birmingham’s Congressman was a staunch supporter of Israel and would emerge as one of the most outspoken proponents on Capitol Hill on behalf of the cause of Soviet Jewry. In 1980, he was defeated in the Republican primary by Albert Lee Smith, as conservative Christian evangelicals, through a relatively new movement known as the “Moral Majority,” began to become better organized and gain more political power. In 1978, as a young reporter for the Birmingham News, I had the opportunity to spend a day with Buchanan on Capitol Hill and then to write a long, full-page profile of Buchanan based on that day for The News. I pulled the story out the other day, just to reflect on Buchanan’s passing and to recollect what I had written. I had picked a memorable day to spend with Buchanan 40 years ago. On that day, major legislation had just been passed to advance the cause of Congressional representation for the District of Columbia, and black leaders were on hand to praise and thank Birmingham’s Congressman for playing such an important role. In addition, I got to attend a hearing with the Congressman on one of the targeted funding initiatives that he felt would benefit African-Americans. A highlight for me was going back and reading the part of my story that dealt with Buchanan’s efforts on behalf of Soviet Jewry. Natan Sharansky — then known as Anatoly — had recently been imprisoned and was being held captive by the Soviet Union for his activities as a Jewish dissident. Sharansky had become a major face of the Soviet Jewry movement. Defiant and determined, it was Sharansky’s desire to emigrate to Israel. Buchanan, who had explained to me that as a Christian it was his duty to advocate for those who were being oppressed, let me sit in on a meeting that he had with an official from an American-based Soviet Jewry advocacy group and Sharansky’s brother-in-law, who had come to lobby Members of Congress. “From the very inception of this case, Congressman Buchanan was the one who took the lead,” Sharansky’s brother-in-law told me after the meeting. As much as I loved journalism and working at The Birmingham News, passions for Israel and Jewish community service were starting to stir within me and three and a half years later I left the paper to join the staff of the Birmingham Jewish Federation. As I re-read the article, I remembered how much that moment — in Buchanan’s office with those two men — impacted me. It showed me that when Jews organize around a common cause, one that is right and just, and enlist allies, such as Members of Congress, we can have an impact. Sharansky would not be freed until 1986. But this meeting in 1978, and all the other activities on behalf of Soviet Jews by Jews worldwide and our allies, would eventually lead to more than 1,000,000 Jews leaving the Soviet Union. After his defeat in 1980, Buchanan went on to become National Chair for a new group, People for the American Way, that was started by liberal activist Norman Lear, a well-known TV producer (“All In The Family”). One of the reasons Lear started the group was to counter the growing influence of Moral Majority, which was becoming increasingly successful in introducing a Christian evangelical point of view into the political arena. For a Republican preacher from Alabama and a respected former Member of Congress to be one of the new group’s prominent spokesmen was a coup. And while Buchanan may not have agreed with all of the Lear group’s positions, he likely took satisfaction in combating Moral Majority which played a role in his defeat. As I read over the long, full-page Birmingham News story I had written, I realized something. It had appeared on March 24, 1978. I was reading it on March 23, 2018, almost 40 years later to the day. I thought about all of the changes that had occurred on the American political landscape since then and wondered whether a politician such as Buchanan — who tried to evaluate issues on a case by case basis, instead of being tethered to a particular ideology — could make it in politics today given the polarized society in which we live? Those who knew John Buchanan and respected and admired him, are no doubt saddened by his recent passing. He was a unique man who brought much credit to Birmingham, and he did as much as anyone to improve our city’s once-racist image nationally. Yes, it was easy to disagree with him on a particular vote or issue — and given his maverick approach to politics most voters probably did at some point. But it was hard not to admire him. He lived life with a purpose and with a dedication to God and his fellow human beings. Click for more on John Buchanan’s passing.